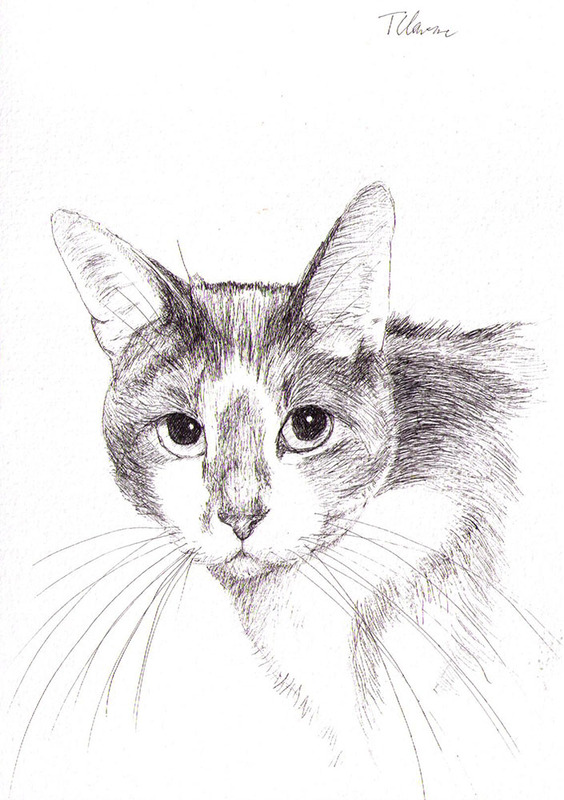 This is a drawing of a cat, lost to his owner. People who’ve spent part of their life in company with a cat or a dog know how difficult it can be to have to say goodbye to their four-legged friend. Sadly, this is an inevitable part of having pets, and the animal always leaves an empty void behind, that can be hard refill and impossible to ignore. Many of my clients are people who have lost a pet, and who want something to remember it by. I always try my best to make something that will capture the essence and the personality of the cat and dog, and hopefully make for a beautiful memorial piece. The client who commissioned this portrait originally asked me to do a charcoal portrait – but I was unhappy with the initial result, and decided to try doing the drawing in pen, which turned out much better. When I quote a price to a future client, the prices are based on an approximate number of hours, but in cases like this, I always weigh quality highest, and it is important to me that both the client and myself are happy with the final picture. This drawing is in ballpoint pen and done on watercolor paper in A5 size. Thomas was wonderful to work with. He was flexible with different mediums I was interested in and supplied a wonderful final product that will hang forever in our home in memory of our first pet together, Rocky the cat. I love all of your drawings. The people who have commissioned you are very fortunate indeed. The drawing of the cat’s hair is excellent in this portrait and the eyes are beautifully done. Wonderful details…………..those eyes……..mesmerizing! I’m sure the owner will love it………. Thanks Pam. I hope so. I was really happy with this one! Wow, this one is really striking! The cat looks perfectly rendered, and in ink?? Pretty amazing. Do you sketch in pencil first, or dive in with the ink right off? Very inspirational, Thomas. My cat died in September and I’ve been drawing her like crazy. As a lifelong cat owner, this one is so true to life and I’m so impressed with your abilities here. Well done!